Amoxycare Palatable Drops are suitable for the control of infections of alimentary tract, respiratory tract and urogenital tract; also know as eye, ear, skin and wound infections in dog and cats. 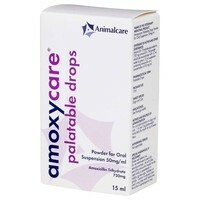 Amoxycare Palatable Drops contain amoxicillin. Use of the product should be based on susceptibility testing of the bacteria isolated from the animal. If this is not possible, therapy should be based on local epidemiological information.